Print out these coupons and save $5 off your first grooming or refer a friend and save even more! Referral Dollars are accumulative. Write your name on the certificate as it appears in the Earthwise Liberty Pet grooming database and give the certificates to your friends to redeem for $5 off their first groom. Upon completion of their 1st groom, the certificates will be catalogued by your name. When your next scheduled groom comes around, you will be eligible to redeem any/all certificates accumulated with your name on it! ​*Full name and coupon required at time of redemption. 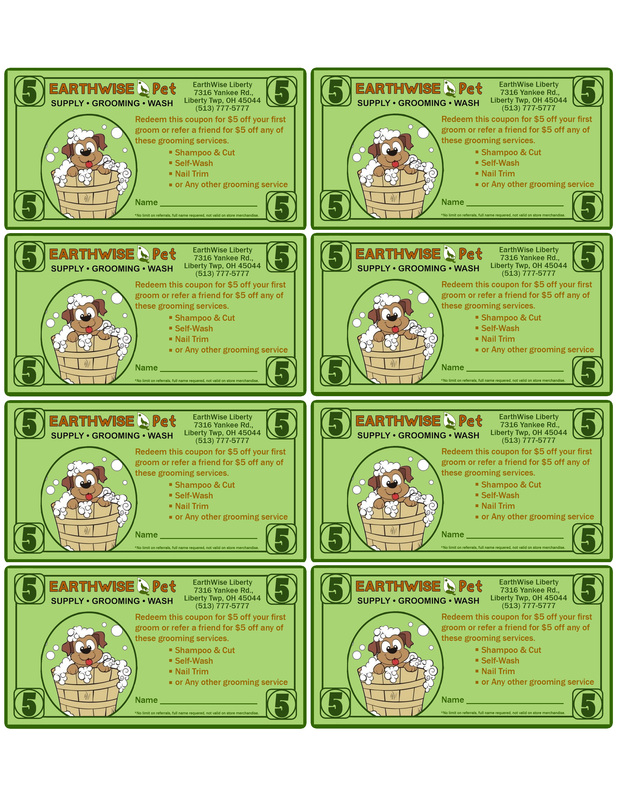 ​Coupons only valid at Earthwise Pet Liberty. Click Here to Print Spa Bucks!